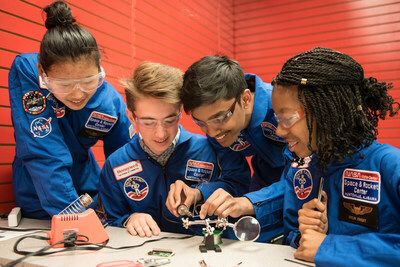 MORRIS PLAINS, N.J., Feb. 20, 2019 /PRNewswire/ -- Honeywell (NYSE: HON) is sponsoring 292 students from 41 countries and 27 U.S. states and territories to attend the annual Honeywell Leadership Challenge Academy at the U.S. Space & Rocket Center (USSRC) in Huntsville, Alabama. The two week-long programs -- the first week from February 23 through March 1, and the second from March 2 through March 8 -- encourage students to pursue science, technology, engineering and math (STEM) careers through real-world, hands-on challenges in coding, computer sciences and astronautics. "Engaging students in science and engineering is now as fundamentally important as learning to read and write," said Dr. Deborah Barnhart, CEO and executive director, USSRC. "By investing in these young students, Honeywell is helping to prepare them to become the global STEM-literate citizens who will change our world." Students between the ages of 16 and 18 will develop STEM leadership skills through numerous team-building challenges such as building, coding and testing rockets; simulated astronaut training; shuttle missions; and a moonwalk. Students will also use computational thinking and computer science to increase their digital skills. Eight students from the prior year's academy were selected to return as ambassadors and mentors to the current group of students. "Last year's academy was a phenomenal experience for me, and I'm looking forward to returning as an ambassador and helping others achieve their goals," said Rohith Tirumalasetti, a student from Hyderabad, India. "Meeting astronauts and participating in simulated exercises confirmed my aspiration to become an astronaut." "The academy greatly helped improve my leadership and communication skills," said Addie Bell, an ambassador from Eaton, Ohio. "I am certain that as this year's students take on challenging activities with other students and instructors from around the world, they will soon know their teammates as friends for life." "As a world leader in software and industrial technology, Honeywell sees the need to increase educational opportunities for students by blending technical knowledge with team-building, communication and leadership skills. The Honeywell Leadership Challenge Academy aims to do that," said Mike Bennett, President, Honeywell Hometown Solutions. "In partnership with the USSRC, we're pleased to offer this program to our future leaders." Since 2010, Honeywell Hometown Solutions, the Company's corporate citizenship initiative, has awarded 2,709 scholarships to children of Honeywell employees. Students are selected through a rigorous application and review process based on academic achievement and community involvement. Honeywell and its employees help fund the scholarships, which cover the cost of tuition, meals, accommodations and program materials. For more information about the academy and the students attending this year, contact Tammy Wolfe (Honeywell), tammy.wolfe@honeywell.com, and Pat Ammons (USSRC), pat.ammons@spacecamp.com. The U.S. Space & Rocket Center, a Smithsonian Affiliate, is home to Space Camp®, Space Camp® Robotics, Aviation Challenge® and U.S. Cyber Camp as well as the Apollo 16 capsule, the National Historic Landmark Saturn V rocket and world-class traveling exhibits. USSRC is the Official Visitor Center for NASA Marshall Space Flight Center and a showcase for national defense technologies developed at the U.S. Army's Redstone Arsenal. Honeywell Leadership Challenge Academy is part of Honeywell Hometown Solutions, the company's corporate citizenship initiative, which emphasizes STEM education, inclusion and diversity, sustainability, child safety, and humanitarian relief. Together with leading public and nonprofit institutions, Honeywell has developed powerful programs to address these needs in the communities it serves. For more information, please visit http://citizenship.honeywell.com/.